Former WWII B-17 pilot Chuck Childs sits in the cockpit of Commemorative Air Force Airbase Arizona’s fully restored and operational B-17 bomber. Comments by Airbase Arizona B-17 pilot Russ Gilmore and former WWII B-17 pilot Chuck Childs. The year is 1942. The Japanese have bombed Pearl Harbor. Hitler and Mussolini are waging war across Europe and looking East toward Russia. And Chuck Childs is on his way to becoming an Army Air Corps pilot of what would become known as “The Flying Fortress” – a B-17 bomber. 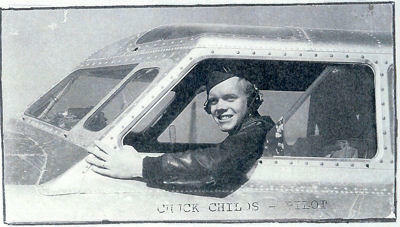 Chuck Childs as a B-17 bomber pilot in WWII. The "Sentimental Journey" taxis to a stop at Rapid City Regional Airport. On a cool, overcast afternoon in June, I’m standing on Rapid City Regional Airport’s tarmac with Air Force legend…Chuck Childs. We’re actually awaiting our turn to fly on a B-17 bomber – something Chuck did dozens of times during World War Two. 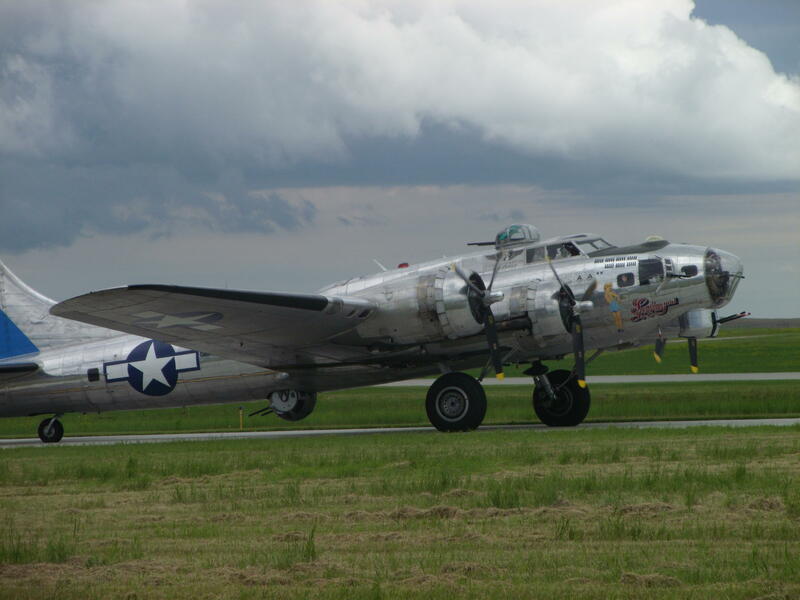 The plane is actually an authentic B-17 from the World War Two era christened the “Sentimental Journey”. The non-profit Commemorative Air Force Airbase Arizona owns the plane and, as pilot Russ Gilmore explains, has spent years fine-tuning its appearance and flyworthiness. Gilmore is a former commercial airline pilot who’s been flying the “Sentimental Journey” for 20 of the 38 years Airbase Arizona has owned it. As for flying the B-17 versus planes he flew for the airlines, Gilmore has this to say. Chuck Childs demonstrates how B-17 crew members used to check their tires before boarding the bomber. “As a positive or a negative?” I ask. In other words, it’s like driving a car without power steering – but on a machine 20 times larger than a Subaru with four 1600-horsepower engines. While Gilmore and his 3-man crew prepare the bomber for take-off, Chuck Childs takes me for a tour of the plane’s exterior. “You’d kick the tire?” I ask. ”You want to kick this one?” I inquire. 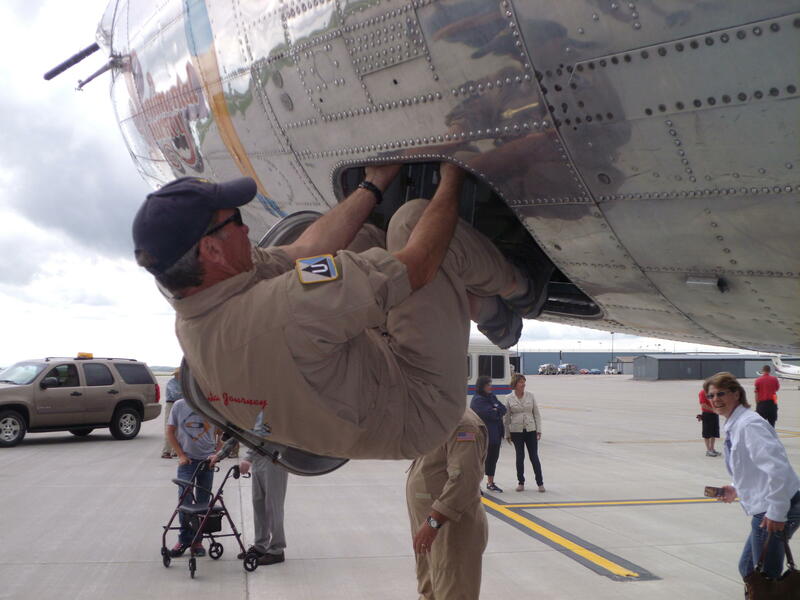 "Sentimental Journey" crew member demonstrates traditional technique for boarding the B-17 bomber. On to the trap door below the cockpit. Our next stop is to the cockpit, where Chuck sits in the pilot’s seat. “Are we ready to take off?” I ask. “I could take off but I don’t remember what those switches are,” Childs replies, with a grin - nodding toward the control panel. “Could that be a problem,” I ask Gilmore. “It could be a big problem…yes,” the pilot responds with a laugh. Cat walk over bomb bay doors – leading from radio room (foregrounds) to cockpit (background). After receiving safety instructions like don’t pull any wires you see and don’t walk over the bomb bay doors, Chuck and I board the plane along with several other members of the media. 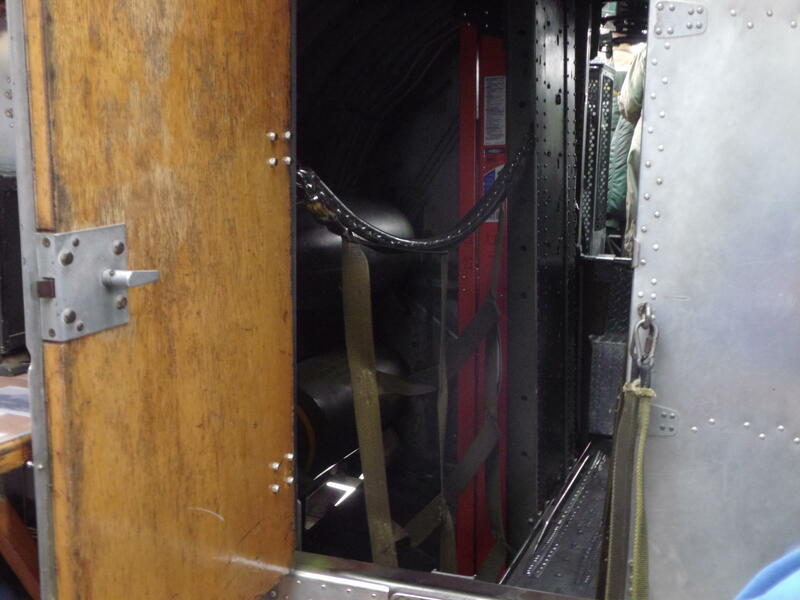 We’re sitting in the radio operator’s section – just behind the cockpit and those bomb bay doors – which are closed. Once everyone’s aboard with their seat belts fastened, the B-17’s engines are turned on. Suffice to say they’re very noisy…which is why Chuck has worn hearing aids for years. And that’s not surprising considering what it was like to fly those 37 combat missions lasting up to 13 hours in this din, combined with the sounds of anti-aircraft guns and enemy fighter planes firing at you, and then adding in the 196 missions Chuck flew as part of the Berlin Air Lift after World War Two. 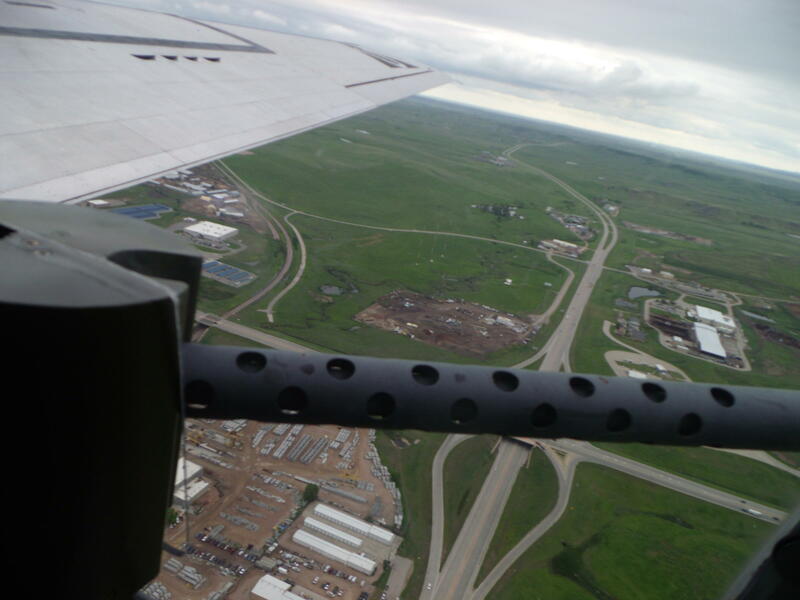 View from waist gunner’s position as ”Sentimental Journey” flies over Rapid City outskirts. The engines get even louder as we take off. Once we level at about 1500 feet, we’re permitted to undo our seatbelts and walk around. The 75-foot long plane with the 100-foot wingspan looks pretty big from the outside…but inside…it’s like walking around in a flying submarine with a variety of small compartments and not more than 6-feet in width. Chuck escorts me toward the back of the plane, pointing out a 50-caliber machine gun station at a large side window, Then he shows me the ball turret – a crew member’s station that’s accessed through the floor of the B-17 and actually hangs outside and below the plane. 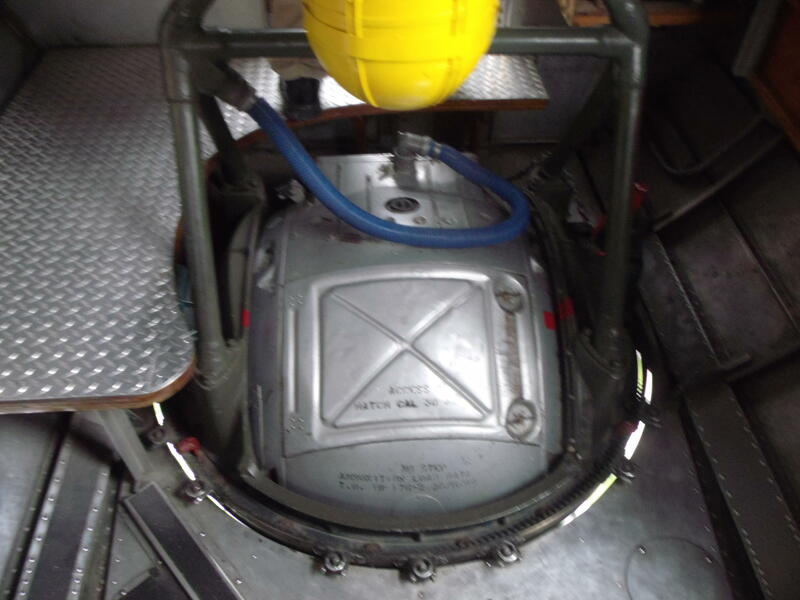 The B-17’ ball turret – “the worst place for a guy to be”. Chuck notes that he once had to drop the ball turret of his B-17 while trying to return to base on very little fuel. It’s a brief 15-minute ride as we circle over the outskirts of Rapid City, but long enough to gain an appreciation of what Chuck Childs and the men who flew with him faced every time they took to the air – minus the horror of being shot at. Once landed, Chuck Childs says he loved the flight. As for the importance of the B-17 to him personally…. 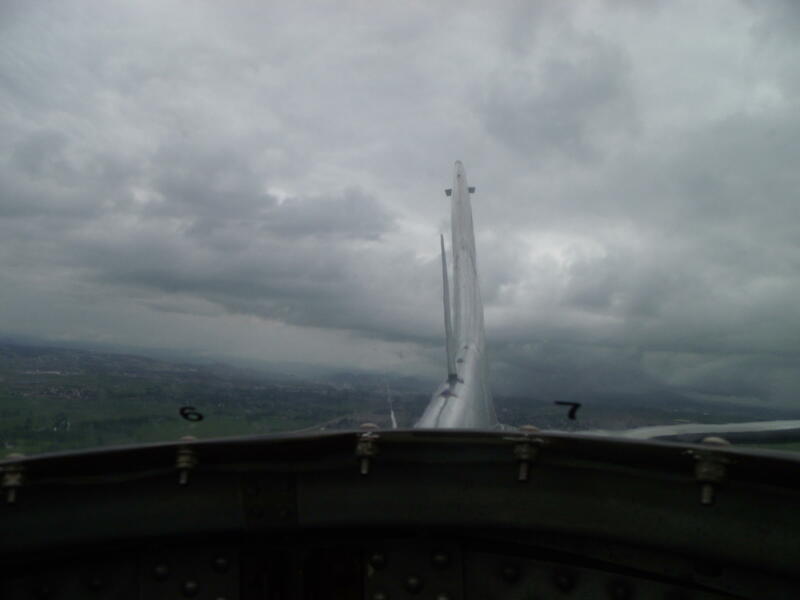 View from radio operator’s room skylight toward tail of B-17. “This was the airplane to fly,” Childs recalls. “Was it a sturdier plane?” I ask. “What made it that way?’ I ask. 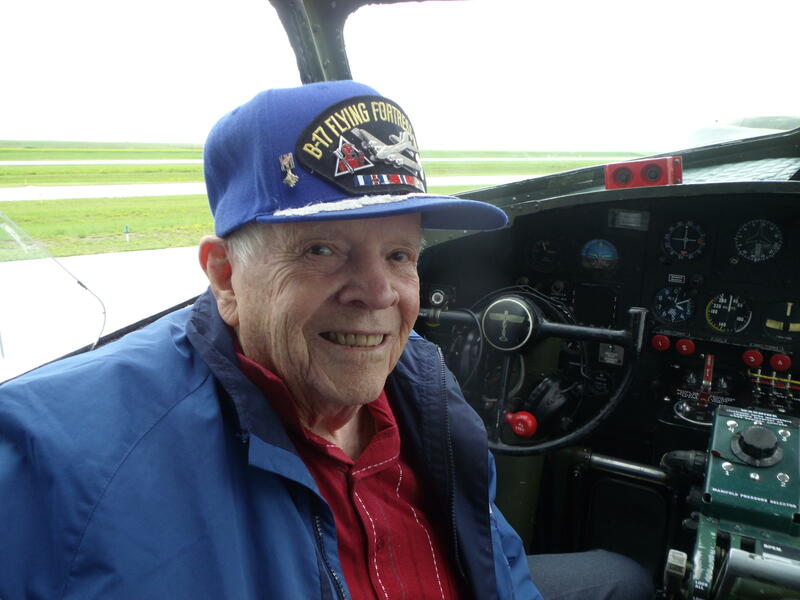 What made today’s flying experience even more poignant for Chuck Childs is the fact that there are no more than eight B-17s in the world that are still operational. 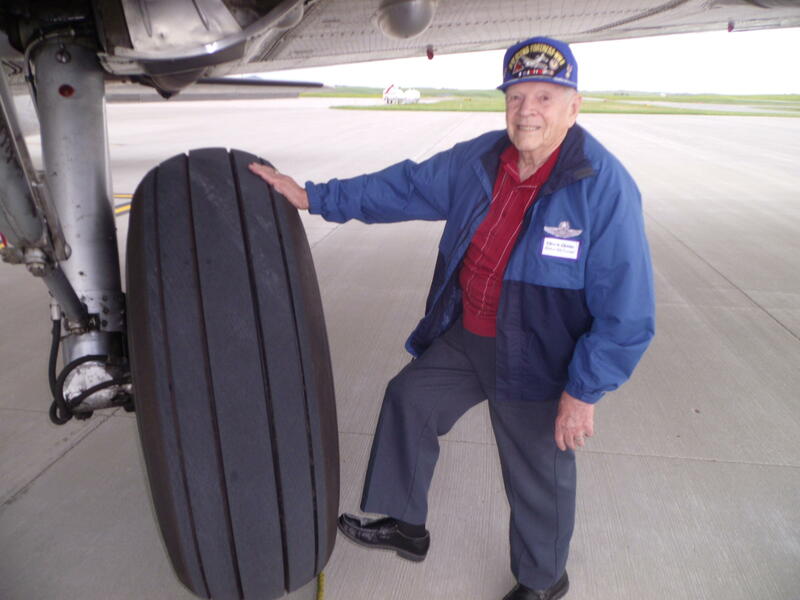 But as the 95-year old veteran walks away from his favorite plane, he can at least rest assured that men like Russ Gilmore will continue to fly this B-17 for as long as they can…to educate the public about what once took place in the skies over Europe. 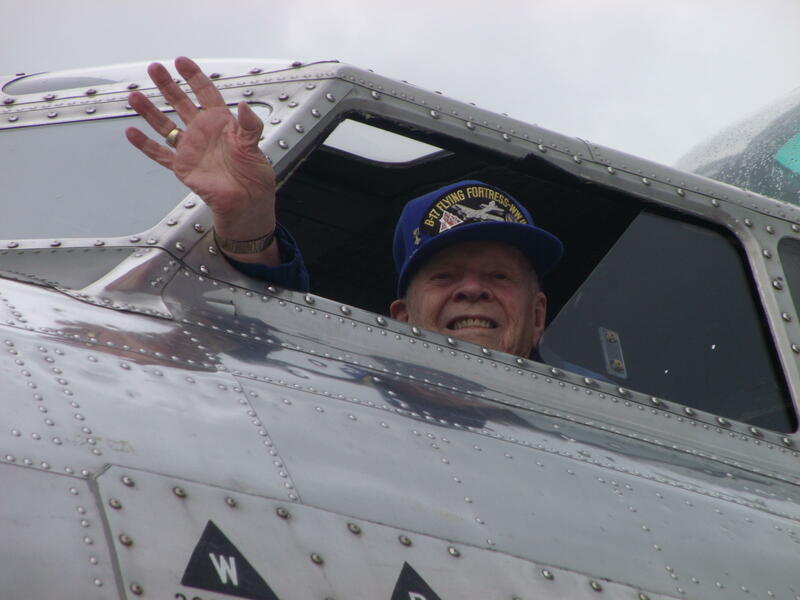 Chuck Childs mimics his classic WWII photo waving from the B-17 cockpit.